Carrie Rhodes has endured abuse her entire life, now she must hide from her ex-boyfriend and the gang that wants her dead. 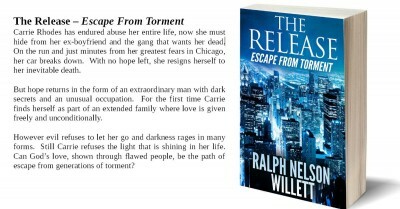 On the run and just minutes from her greatest fears in Chicago, her car breaks down. With no hope left, she resigns herself to her inevitable death. But hope returns in the form of an extraordinary man with dark secrets and an unusual occupation. For the first time Carrie finds herself as part of an extended family where love is given freely and unconditionally. However evil refuses to let her go and darkness rages in many forms. Still Carrie refuses the light that is shining in her life. Can God’s love, shown through flawed people, be the path of escape from generations of torment?